Going to 86’d Mondays at the Drake Hotel is becoming a regular indulgence. This past Monday featured a wicked variety of tacos and premium tequila tasting. Sweetening the event even further, free beers were also handed out as it was the Drake Hotel’s 8th birthday. Now with this promise of a good time, how could I not show up? Ever since the summer’s Food Truck Eats events at the Distillery, I have followed and witnessed on Twitter the cult following for Rossy Earle’s Supi Cucu Diablo’s Fuegos. As I am a little reserved of anything overly hot and spicy, I haven’t tried the hot sauce before. I have always opted for her less spicy dishes or I would always just leave the added hot sauce on the side. But a few weeks ago, while talking to Rossy, she describes this hot sauce having a slow burn, just enough for a highlight and a kick. She promises it is not something that would make you cry as you take a bite. Mustering my courage to take on Rossy’s hot sauce, I finally decided to try out the famous Diablo’s Fuegos. Arriving a bit late with my friend and food stylist, Abe Wornovitzky, we saw a healthy long line to the taco tables. I was expecting to see a full table of Supi Cucu’s tacos and a display of bottled Diablo’s Fuegos. What we later found out was that there was a second participant to the event. Woohooo! The more the merrier, I say. There were three tacos for the night. Two were created by The Fuel House, slowly cooked and looking so tender, whole hog taco with braised pork, salsa & roasted garlic sour cream; and a vegetarian taco with pulled jackfruit, Asian BBQ sauce w/ daikon, mango, snap pea, red pepper slaw. Supi Cucu’s taco was a promise of crunchy alligator tots, slathered with avocado rémoulade, chive coulis, Diablo’s Fuego, crema & pickled red onions. To anyone who knows me, I almost always opt for anything with meat (I can just see my grandmother frown that I don’t eat enough veggies). I took one of The Fuel House ‘s whole hog taco and one of Supi Cucu’s alligator taco. The problem of being a nerd of a photographer was that you would always seek good lighting for most of anything you shoot, even snapshots. As I walked toward the Drake’s reception area to find better lighting, Ivy Knight stopped me to hand me a ticket for a free tequila shot. The night got better and better by the minute for sure. After my countless attempts of giving justice to the two tacos I bought, I went back inside the Drake Hotel’s bar and sank my teeth into Supi Cucu’s Gator taco. The crunch of the breading, the moist meat within, the melding of the smooth avocado, Diablos Fuegos, crema and flavour of onions danced merrily on my mouth. Rossy Earle was right about that hot sauce. It did not kill my palette and the burn slowly happened, giving me that needed kick for a very well-executed gem of a taco. My job done with Supi Cucu’s taco, I turned to The Fuel House’s whole hog taco. Just as promised, the pork was moist and tender, the salsa and roasted garlic sour cream was definitely a good match to the flavor of the meat. I realized I devoured both tacos in record minimum time. 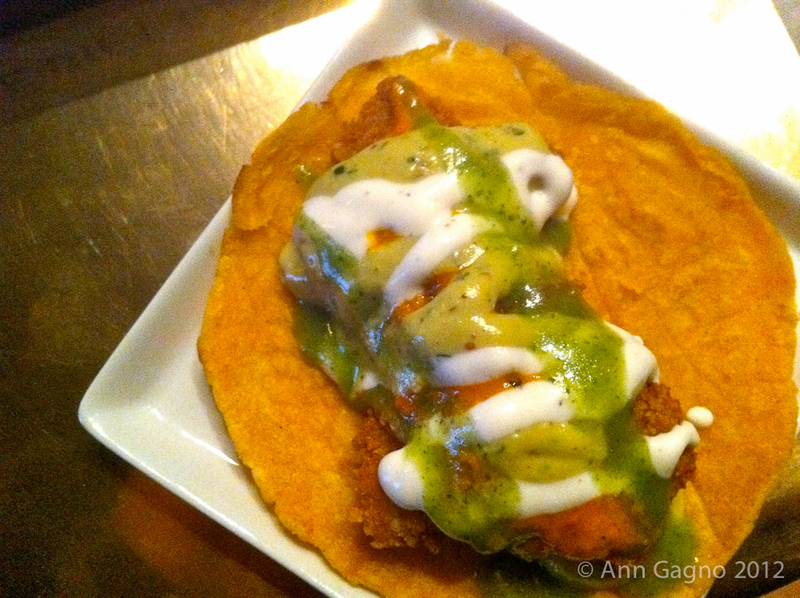 I shamelessly wanted more and I go for one more of Supi Cucu’s Gator taco. Abe tells me he cannot look at me when I eat a taco. I have so much joy for it that it is hard to keep his resolve to be vegetarian for the night. He did tell me that the Fuel House’s vegetarian taco was exceptional and very well-thought.